Happy New Year!! I can’t believe 2019 is here…where did 2018 go? I took a little bit of a blogging break the last couple months, but like everything, I’m ready to get back to a regular schedule of posting new recipes, working out, reading and focusing on slowing down. I’m part of several mom groups on Facebook and when a request came out for donations to our local Fire Company for their Holiday Appreciation dinner, I knew I wanted to make them something. While we have never needed their service, they have done so much for our community and are always there…so needless to say, it was the least I could do. I did a little scouring of my Pinterest boards and discovered this recipe for cranberry pecan cake. It looked pretty easy to make in between everything else I had going on and whipped it together in time for their dinner. It smelled amazing, that I had to make another one for my Christmas dinner at my in-laws. It tasted just as amazing as it smelled! It’s a moist cake spotted with tart pieces of cranberries, crunchy pecan bits and topped with a perfectly sweet cream cheese frosting hinted with orange and more pecans. You can’t go wrong with this cake! the winter and then rarely use them the rest of the year – except that’s going to change with this recipe for cranberry bbq sauce! It’s tangy and a little sweet, but the perfect addition to grilled chicken or to smear on a grilled turkey and cheese sandwich. I developed this recipe for sauce as part of Cape Cod Select’s First Annual Blogger Recipe Challenge.This was my first time working with Cape Code Select Premium Frozen Cranberries and I was really impressed with them. They’re packaged in a bag with a resealable top to make it easy to portion out and because they’re frozen, they’re available year-round! Check to see if your local grocery store carries them! After creating this sauce recipe, I cooked a batch of chicken wings in my instant pot, tossed them in sauce and then under the broiler they went…. and I didn’t get pictures before they were gobbled up! Visit Cape Cod Select over on their website or follow them on Facebook, Instagram, Pinterest or Twitter for more delicious recipes and find out where you can get your own Cape Code Select Cranberries! Last weekend, we had a little taste of fall and it made me want to get into the kitchen and make something. Madeline has been asking for granola and I’ve been waiting to make this recipe once it got cooler. I’m so glad I didn’t have to wait any longer. It is so good and so simple and easy to make. We both have been eating it on top of plain Greek yogurt, but you could totally eat like cereal too! I love the warmth from the spices too…it reminds me so much of fall. I’ve been trying to be really good lately with my diet, but I still have a few recipes left from the holidays that I need to share. We’re finally dug out from this weekend’s big winter storm…around 30 inches of snow fell in a 24 hour period. It’s been crazy and I’m so glad things will be back to normal soon. So needless to say, I’m wishing snow day calories didn’t count! These pinwheel cookies are so good. I love the combination of the chewy cranberries, sweet honey and crunchy pecans all wrapped up in pie crust. They’re super easy to make and you can easily switch out the filling ingredients to whatever you’d like. I bet apricots and walnuts would be really good! In a medium bowl, mix together the cranberries, pecans, sugar and orange zest until well combined. Roll out the pie crusts on a generously floured surface into a square. Brush each pie crust with the melted butter. Spread the cranberry-pecan mixture evenly over both crusts. Roll each pie crust into a log, pinch the edges to seal. In a small bowl, whisk together the egg and water. Brush each log with the egg water mixture and then slice each log into 10 equal pieces. Place the slices cut side up about 1 inch apart on the prepared baking sheet. Bake for 15 minutes or until golden brown. Transfer to a cooling rack and drizzle honey over the top of each pinwheel. Allow to cool completely before serving. Enjoy! Welcome to the August reveal of Fill the Cookie Jar – a monthly Facebook group that shares cookie and cookie bar recipes based on a specific theme. This month the theme was anything that makes you think of kids or back to school. I decided to with the “Back to School” route and chose a breakfast cookie. 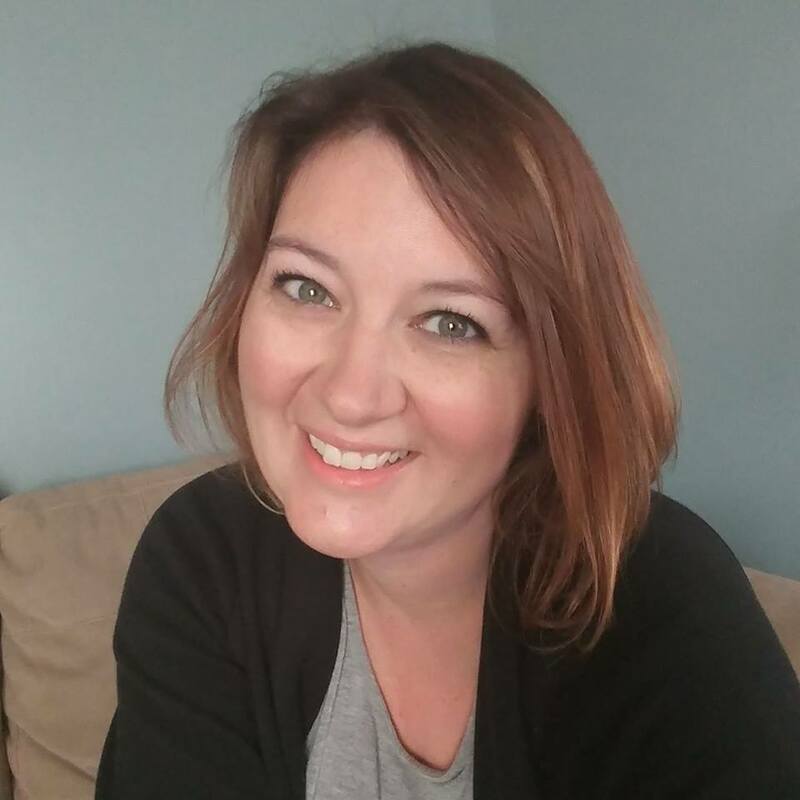 This summer has been a break from making breakfast for my daughter since she went to camp, but with school starting in a few short weeks, I need to get back to brainstorming ideas for her. She’s not a big fan of breakfast to begin with, so this cookie is the perfect compromise. 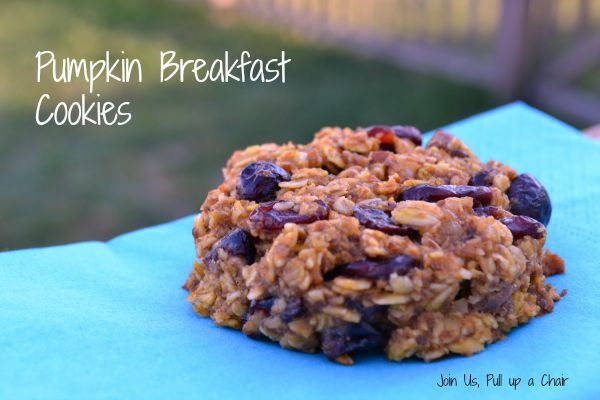 It’s full of oats, cranberries, walnuts and some extra ingredients to make them healthy. She gobbled one up right after I took them out of the oven and told me how good they were and how she wanted a second one. Preheat oven to 325 degrees and line a baking sheet with parchment paper. In a glass measuring cup, warm the coconut oil and honey together. Set aside to cool. In a large bowl, combine the two types of oats, cranberries, walnuts, flax, pumpkin pie spice and salt. Stir in the pumpkin puree, eggs, and oil-honey mixture until well combined. Scoop the batter out using at 1/4 measuring cup and place on the prepared baking sheet. Press down slightly until the cookies are around 1/4-1/2 inch thick. I kept mine on the thicker side. Bake for 15 to 20 minutes until the cookies are golden brown. Cool completely on the baking sheet and then transfer to an airtight container. Enjoy! Check out all the other bloggers participating in this month and find out what they were baking using the link below! This is my second year participating in the Great Food Blogger Cookie Swap. It’s so much fun and I love that we partner with Cookies for Kids Cancer to help support this amazing non-profit! Once you’ve signed up to participate in the swap, you’re assigned three other food bloggers and send each one a dozen cookies. Then you get three dozen cookies in the mail! My kids were loving this and came home each day waiting for our swap cookies to arrive. The one requirement is that we’re to make a cookie that is new to us. I searched high and low and found a recipe for pistachio shortbread cookies. Well…after seeing the price of pistachios (holy sticker shock!) I decided to take the base recipe and make a few modifications to use common ingredients that I always have in my pantry – dried cranberries and ground vanilla beans. These cookies are easy to make and modify to whatever flavor you want! 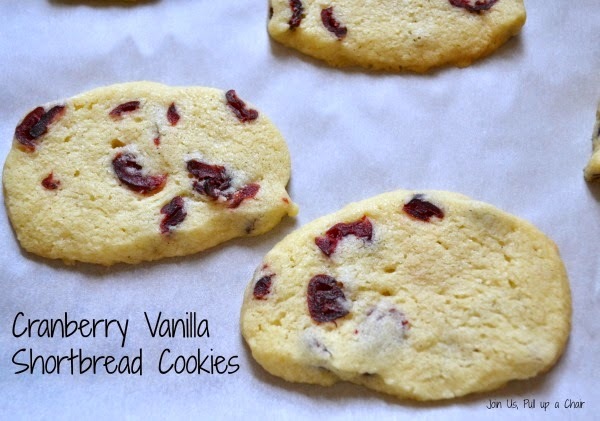 They would be great with fresh orange zest or lemon zest instead of the vanilla….the possibilities are endless! In a bowl of a stand mixer, cream together the butter and sugar until fluffy and light. Add in the vanilla extract and mix. In a small bowl, whisk together the flour, cornstarch and ground vanilla bean. Slowly mix in the dry ingredients with the butter-sugar mixture until a dough forms. Stir in the cranberries by hand. On a foot long piece of plastic wrap, form the dough into a log about 9 to 10 inches long, about 2.5 inches thick. Wrap the dough and place in the refrigerator for at least three hours, preferably overnight. When you’re ready to bake the cookies, preheat the oven to 350 degrees and line two baking sheets with parchment paper. Slice the dough with a serrated knife 1/4 to 1/3 inch thick and place on the prepared baking sheets. Bake for 10-15 minutes depending on the thickness of your cookies. Allow to cool for 2 minutes on the baking sheet and then transfer to a wire rack to cool completely. The Freshman Cook sent me the cutest Gingerbread Men. The kids gobbled them up! Susan from A Less Processed Life sent delicious Billionaire Bars..I devoured these! The Toasted Sprinkle sent a dozen Cris Kringle cookies. My husband loved these! 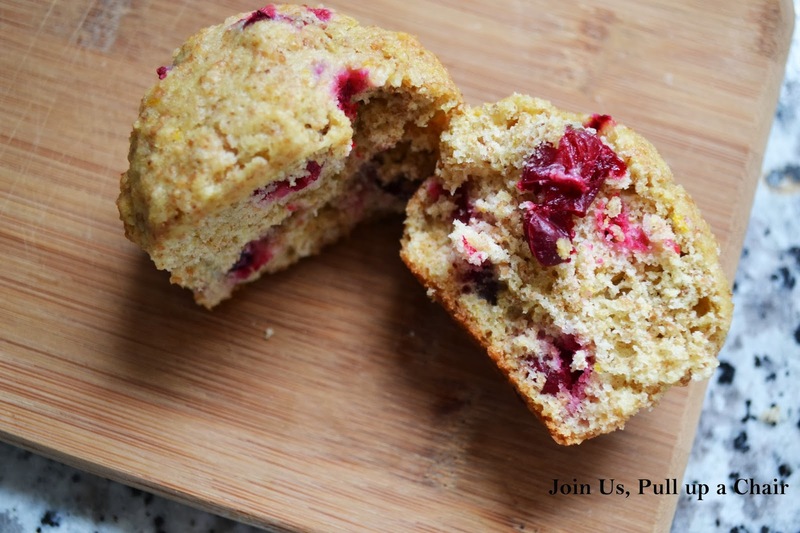 Cranberry and orange always remind me of the holidays and these muffins didn’t disappoint! I made a few changes from the original recipe but they turned out perfect. Madeline loved them but Cooper wasn’t too impressed with them – I’m thinking the tartness from the cranberries turned him off. I’m planning to use this same recipe to make mini loaves of bread as gifts. They’ll make the perfect afternoon snack! Preheat your oven to 400 degrees. Line a muffin tin with paper liners and set aside. In a large bowl, combine the flours, sugar, baking powder, baking soda and salt. Add in the cranberries an stir. In small bowl, combine the melted coconut oil, orange juice, egg and orange zest. Pour the wet mixture into the dry and combine just until moistened. Spoon the batter into the muffin tins until they are 3/4 full. Bake for 15 to 20 minutes until the tops are lightly browned. Enjoy them warm from the oven or at room temperature.